The Cleveland Flea kicked off the weekend showing off their brand new store front at 3333 Lorain Avenue in Ohio City. All four holiday fleas are three day events set up on a pay structure to ensure that the building is not too crowded. Friday is Party & Shop ($20), Saturday is Classic Flea Experience ($10 from 10:00-2:00, then free), and Sunday is Brunch & Shop (free). This prevents everyone from showing up at the exact same time and overcrowding the 20,000 square foot space. We decided paying was best for us and opted for the Saturday morning event -- two of our friends came with us as well. 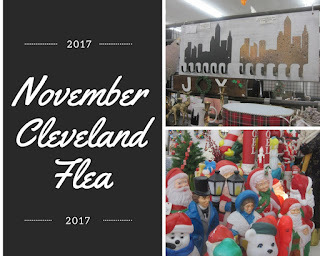 Dave and I had previously attended an outdoor flea, but never a holiday pop-up and Kaley & Jon were new to the Cleveland Flea experience and had been wanting to attend one. We arrived slightly before 10:00 and the small parking lot at the building was full, but there was plenty of free street parking available near the venue.